LAKE BUENA VISTA, Fla., April 9, 2018 - In the new Toy Story Land that opens June 30 at Walt Disney World Resort in Florida, the fun extends to food, and meal time comes with a heavy helping of nostalgia. Woody's Lunch Box will serve up classic on-the-go menu items with a creative twist. Located in Disney's Hollywood Studios, the new 11-acre land brings to life all the magic and fun of the hit Disney●Pixar animated "Toy Story" franchise. In this land – inspired by Andy's backyard from the films – guests "shrink" to the size of a toy and set off for thrills and laughs on three signature attractions. LAKE BUENA VISTA, Fla., Feb.16, 2018 - It's a joy-filled, toy-filled world as only Disney can create, and it opens June 30, 2018. The all-new Toy Story Land at Walt Disney World Resort is inspired by Disney•Pixar's Toy Story films. 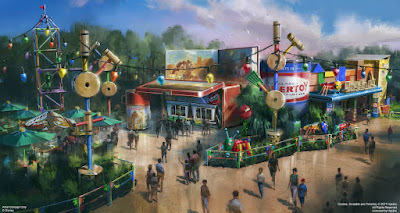 Guests in Toy Story Land – located at Disney's Hollywood Studios – will feel like they have shrunk to the size of a toy as Woody, Jessie, Buzz, Slinky Dog, the Aliens, Green Army Men and other fun-loving Toy Story characters come to life in the larger-than-life outdoor setting of Andy's backyard.